This project is the data gathering of the harvest mouse Micromys minutus, for the habitat conservation. The research aims at making the fundamental data of a protection policy of the harvest mouse, which is called "Kayanezumi" in Japan, together with citizen. The harvest mouse is the smallest mouse in Japan. 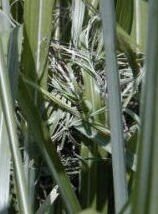 The species inhabits grass field such as Japanese pampas grass Miscanthus sinensis. Grass field bears a role important for Satoyama's biodiversity. In recent years, grass fields has been decreasing rapidly by human activities. As this reason, the shortage of an understanding about the importance of grass field found from preservation of biodiversity can be considered. We want citizens to understand the importance of grass field through this investigation. We want also citizens to get volition about the conservation of grass field. 1. 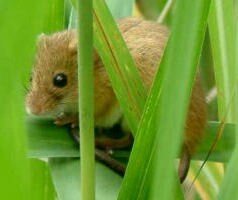 To investigate the distribution of the harvest mouse nationally in collaboration with a citizen and making "Kayanezumi-map." 2. To solve the question of the breeding ecology of the harvest mouce. 3. To publish a handbook to summarize the result of investigation and as data of environmental education for citizens. Since 1999, we have investigated domestic distribution of the harvest mouce, and have accumulated the information of the species. The results of the research has reported every year on the website http://kayanet-japan.com/.However, the amount of information is still insufficient. It is necessary to take a positive protection policy immediately for this tiny animal. If you have some information of the harvest mice, please tell us by e-mail . We hope this project contributes to preservation of Satoyama's rich biodiversity. 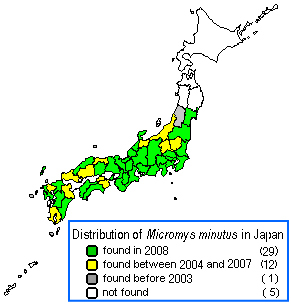 The special report of the distribution and habitat conservation of the harvest mouse in Japan. The book at left is Part 1, published in 2003. The book at right is Part 2, published in 2006 (in Japanese, 32pp. size: A5. price: 500 yen).